What’s in an Irish Border? 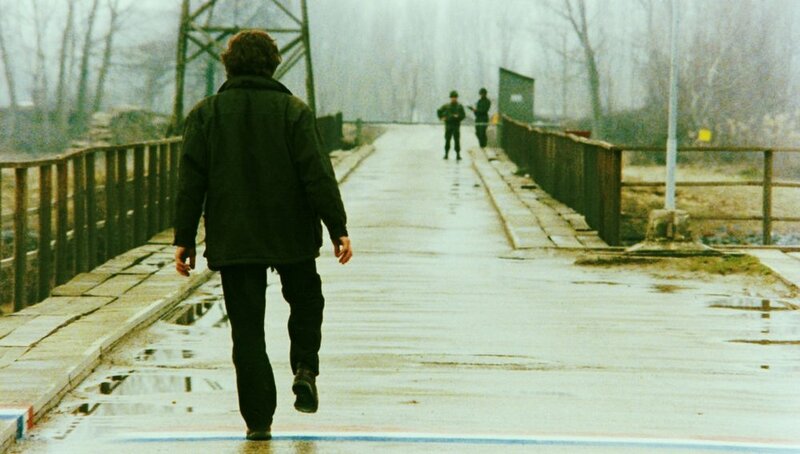 In the first film of what could be loosely considered Theo Angelopoulos’ Trilogy of Borders, The Suspended Step of the Stork (1991), there is an image of a stranger standing on a bridge poised over the dividing line between two countries. He has one leg suspended in mid-air, like a stork. ‘If I take one more step I am... somewhere else, or... I die’. The reality of borders between EU Member States, however, bears little resemblance to the dystopian images of that movie. The single market allows citizens, goods, services and capital originating from the 28 Member States to move freely within the EU territory. In particular, with regard to the Irish border, the membership of both the Republic of Ireland and the UK to the EU and the Good Friday Agreement have turned a border that was emblematic of an intractable and bloody conflict to an invisible one. Brexit, however, challenges the significant progress that has been achieved in one of the most impoverished areas of the UK by creating disturbances to the all-island economy of Ireland. In her Lancaster House speech, Theresa May has explained that the UK wants to be out of the single market and the customs union once Brexit takes place. This means that there will be –at a minimum- a customs territorial border on the island of Ireland. The reason being that both the UK and the EU would want -among else- to certify the origin of the goods they import in order to impose relevant tariffs and to ensure that those goods follow their regulatory standards. This might sound as a rather banal problem. It is not. Let’s take as an example the village of Pettigo in order to understand how difficult it would be to create a territorial customs border on Ireland. Pettigo is a small village that is bisected by the Termon River, which is part of the border between the Republic of Ireland and Northern Ireland. In other words, one part of the village is in the Republic and the other in the UK. If the UK is out of the single market and the customs union, this would mean that some kind of customs control would have to take place for goods that would be crossing from one side of the village to the other causing huge problems to the everyday life of the people and the economy. Virtually all the companies that are established in the numerous border regions of the island would face similar issues. More importantly, some immigration controls would also have to apply making the free movement of people on the island more difficult than it is at the moment. Of course, those challenges are to be expected from the withdrawal of any Member State from the EU. In the case of the Irish border, however, the violent past of the conflict urges all the parties in the Brexit negotiation to find an arrangement that would not exacerbate the tensions and the cleavages that exist between the two main communities: the Unionist/Protestant one and the Republican/Nationalist/Catholic one. This is why the EU has made the Irish border one of the three priorities that would have to be addressed before the negotiations on the UK-EU future relationship could take place (the other two are the citizens’ rights and the ‘divorce bill’). Anyone with basic knowledge of the intractability of the conflict in Northern Ireland would immediately appreciate how difficult it would be to solve this conundrum. In the beginning of last week when DUP -the biggest party of the Unionist community- which is in a confidence and supply agreement with the Conservatives vetoed the compromise that the UK government and the EU had reached, those difficulties became apparent to everybody. After four hectic days of diplomatic efforts, on Friday 8 December, the EU and the UK found a way to ‘square the circle’ and agreed to move to the second phase of the negotiations. The solution that was found suggests that the aim of the future negotiations would be to address the challenge of the Irish border through the overall EU-UK relationship. If the Withdrawal agreement finds it impossible to provide for a frictionless invisible border, then, ‘specific solutions’ will apply to Northern Ireland. Finally, if the UK and the EU cannot agree on those 'specific solutions', then the UK will remain aligned to the single market and the customs union. Realistically speaking, given that even the most advanced free trade agreement cannot eliminate customs controls and that the UK has said that it does not want to remain aligned with the single market and the customs union after Brexit takes place, an invisible border could only be achieved if ‘specific solutions’ are agreed for Northern Ireland. This important concession has opened the possibility for a differentiated Brexit. In other words, Northern Ireland can potentially enjoy a differentiated special relationship with the EU even after Brexit takes place. So, what’s in a border? Conventional wisdom suggests that borders divide people, societies, States, economies and legal systems. In the case of Brexit, however, the Irish border might –just might- become the pulling factor that could keep (at least a part of) the UK in a close relationship with the EU. For a region that became famous for its divisions, such a role is almost an irony of history. This article was first published on MacroPolis on 11 December 2017.